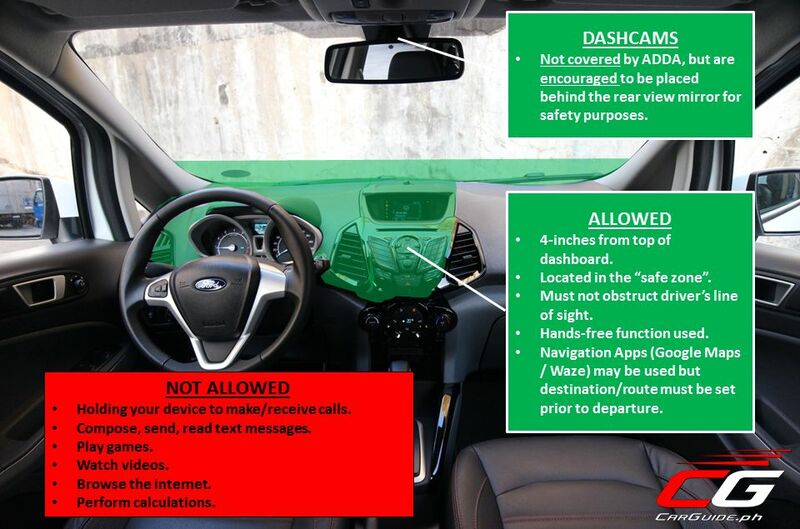 Are You Ready for the Anti-Distracted Driving Act Part 2? Who are covered by the ADDA? It will cover both private and public vehicles. It also covers wheeled agricultural machineries, construction equipment, and other forms of transportation such as bicycles, pedicabs, trolleys, “habal-habal”, “kuligligs”, wagons, carriages, and carts that may either be human-powered or pulled by an animal as long they are driven or operated on public thoroughfares, highways, or streets. What acts are not allowed under the ADDA? Holding your device to make or receive calls. Compose, send, read text messages. The mere act of holding an electronic device while driving constitutes distracted driving. Yes, provided that the driver is making an emergency call to authorities to report crimes, accidents, terror attacks, fire, explosion, or instances that require immediate medical attention. It also allows you to use your phone when personal safety or security is compromised. What isn’t considered as distracted driving? 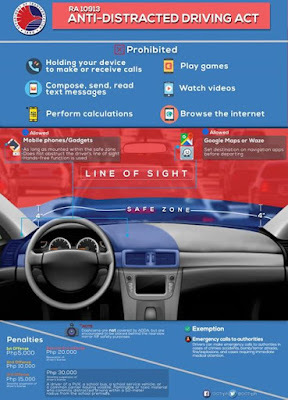 The operation of a mobile device is not considered distracted driving if it’s done using the aid of a hands-free function or similar device such as, but not limited to, a speaker phone, Bluetooth, earphones, and corded microphones provided that the driver can make and receive calls without having to hold the device. 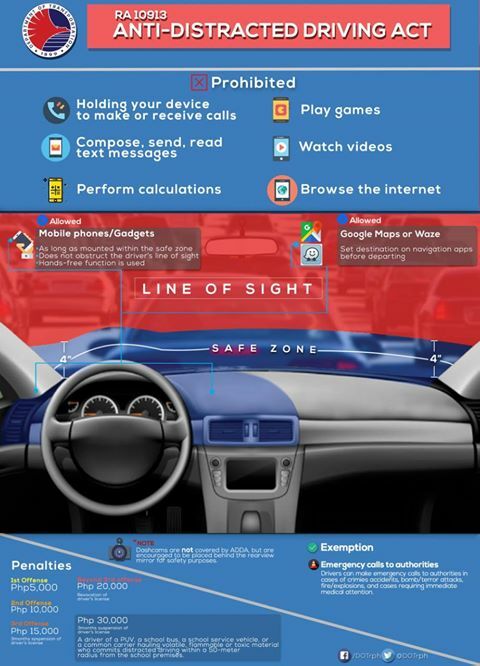 Also, the placement of the hands-free device (along with the mobile device) must not interfere with the driver’s line of sight. 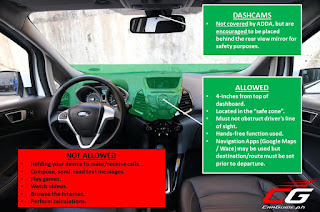 In a clarification, a driver can indeed touch his mobile device provided it’s to answer a call or confirm a new route using the navigation app, or in the case of Uber and Grab drivers, start or end a trip. Where can I mount by mobile phone or hands-free device? It can be mounted in a designated safe zone. As a guide, the Department of Transportation has set a 4-inch limit from the top of the device to the top of the vehicle’s dashboard. Even if it sticks out a bit, for as long as the driver has made an attempt to mount it as close to the base of the windshield, there’s a presumption of compliance. Are dash cams covered by the ADDA? Dash cams are not covered by the ADDA, but are encouraged to be mounted behind the rear view mirror for safety purposes. What about Rosaries? Toys? Ornaments? 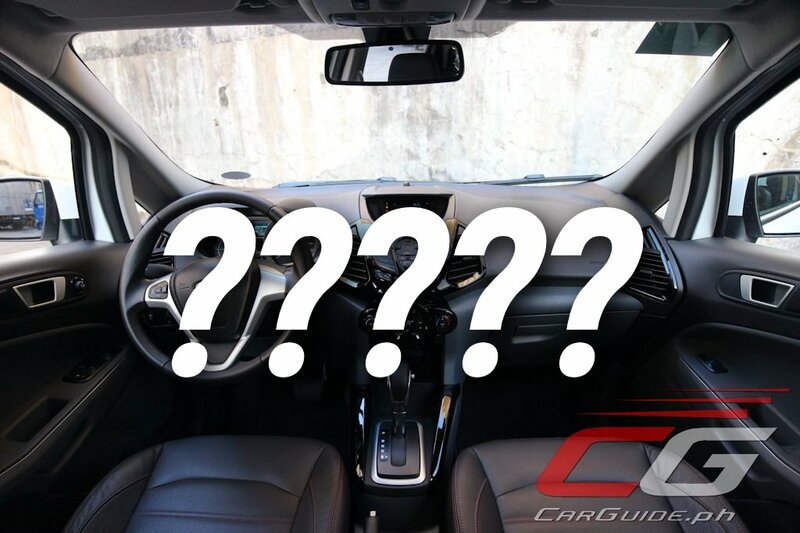 A sticking point in the previous implementation of the ADDA, the revised Implementing Rules and Regulations (IRR) does not cover ornaments and toys placed on the dashboard or hanging from the rear view mirror. The ADDA merely covers mobile communication devices and electronic entertainment gadgets. Who can catch me for ADDA violations? The Metropolitan Manila Development Authority (MMDA), the Philippine National Police (PNP), and other concerned government agencies and instrumentalities such as, but not limited to, the respective provincial/local government units and special economic zone authorities. How will they catch me? Violators will be penalized with a fine of Five Thousand Pesos (P 5,000) for the first offense, Ten Thousand Pesos (P 10,000) for the second offense, and Fifteen Thousand Pesos (P 15,000) for the third offense with a three-month suspension of driver’s license. Violations incurred beyond the third offense shall be penalized with the revocation of driver’s license and a fine of Twenty Thousand Pesos ( P 20,000). For drivers of Public Utility Vehicles (PUVs), school buses, school service vehicle, or a carrier containing volatile, flammable, or toxic substances, it’s a fine of Thirty Thousand Pesos (P 30,000) and a revocation of the driver’s license when caught within 50 meters of a school zone. Wala pang balita kung ano ang pwede and hindi pwede na tint. I doubt CCTV footages can be used because some of them may or may not be high resolution cameras. And one cannot rely on enforcers words that they saw one violating the ADDA. Enforcers should be mandated to wear body cams to validate their claim or it would just be open to more abuse and proliferation of kotong cops. I hope this get implemented ASAP. Too much annoying drivers using their phone while driving too slow you can see their faces lit by their phone monitors. Anyone who is using dual lens dashcam here? where do you mount it? kasi kung behind the rear view mirror, hindi na useful ung other lens for the driver and passenger. appreciate your inputs! Behind the rear view mirror parin. Transcend DrivePro 520 ang gamit ko and I'm not having any issues with it. Hi, I have perused a large portion of your posts. This post is likely where I got the most helpful data for my exploration. Much obliged for posting, possibly we can see more on this. Are you mindful of whatever other sites on this subject. This is a decent post. This post gives really quality data. I'm unquestionably going to investigate it. Truly exceptionally valuable tips are given here. This post is likely where I got the most helpful data for my exploration. Much obliged for posting, possibly we can see more on this. Are you mindful of whatever other sites on this subject.